Spoiler alert: polluting the San Francisco Bay with a bunch of balloons is an easy way to get in trouble with both citizens and the law. Remember that slightly-bizarre rally that THQ held yesterday to promote Homefront? 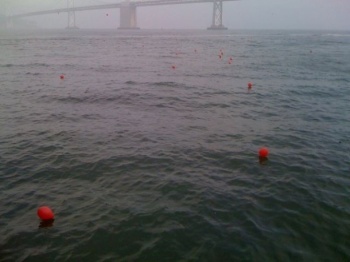 Well, it turns out that residents of San Francisco are less-than-thrilled with it because of how the hundreds of balloons that were released wound up floating in the San Francisco Bay. Folks apparently took to Twitter and Facebook to yell at GameStop, since the company's name appeared on the balloons. GameStop, in turn, claimed that it knew nothing about the balloon release until THQ let them fly. As GamePolitics points out, this logic is straight up bizarre: "we knew yesterday that THQ planned on doing this, so how GameStop didn't have any prior knowledge is pretty baffling." "We understand the concerns consumers have regarding the impact balloons can have on the environment. However, the balloon drop stunt in San Francisco was created by THQ, the publisher of Homefront, and GameStop had no prior knowledge of it. THQ has since informed us that they released soy-based, biodegradable balloons." THQ also explained that the balloons are totally biodegradable and start breaking apart as soon as they're filled with helium. Of course, that isn't enough for some residents of the Bay Area, like Anne Bauer of The Marine Mammal Center. "It's still trash," Bauer said. "It's biodegradable over time, but a bird can still get entangled in it right now. A sea lion could be curious about it, bite it and swallow it. It could clog their stomach and cause them to die--right now. Biodegradable takes time to happen."